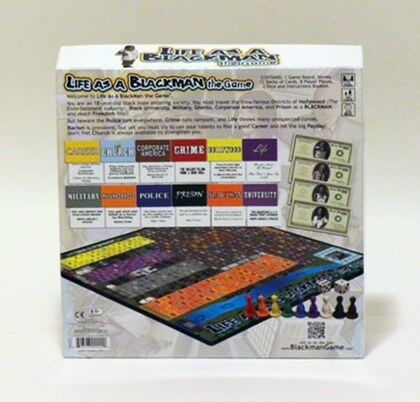 Tired of Playing those same old boring Board Games? 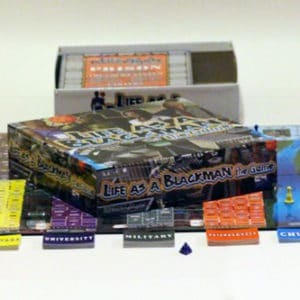 Well, the folks at Underground Games, Inc., a Black owned game company, have come up with the most fun and interesting board game concept to ever hit the Market. 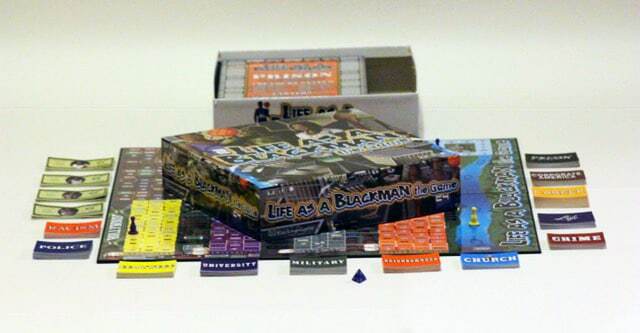 Life As A BlackMan the Game is the first and only board game to depict life from the perspective of a minority. “This is the party game for the next millennium,” says Chuck Sawyer, C.E.O. 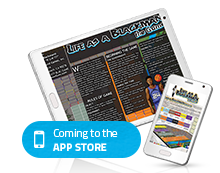 Underground Games, Inc.
You’re an 18-year-old African American High School graduate(Male or Female) entering society. Where will you begin the game? Hollywood, The University, Military or The Neighborhood? Well, that’s determined by the roll of the die, when we’re born we can’t choose our Socioeconomic Status. What type of person, or shall I say Character Type will you have? Creative, Intellectual, Athletic? This is your Special Talent. What are you going to do with it? Do you know good from evil? Will it be Church or Crime? Crime equals Police and Prison. 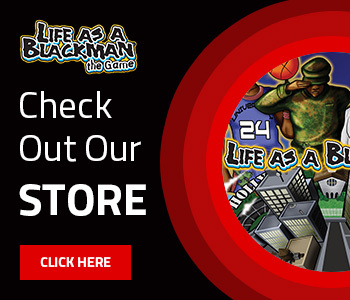 Do you have enough money for the Dream Team Attorney? If not the Public Defender is free of charge, but not very much help. What kind of car will you drive? SUV, Used Car, Bucket, or are you riding the Bus? Remember you need some form of Transportation to get around in Downtown. There’s plenty of Action in the Cards, 360 in all, and it only takes 15-45 minutes to complete an entire game. 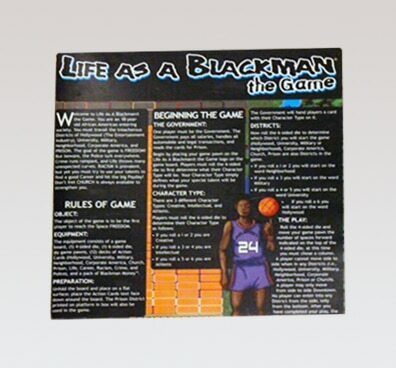 There’s only one goal in Life As A BlackMan the Game, and that’s FREEDOM. No more going around in endless circles. 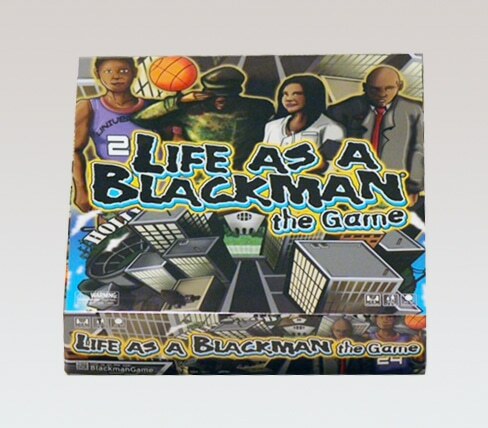 To begin the game, chose a player to be the Government. 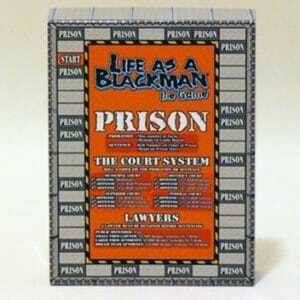 The Government pays all Salaries, handles all automobile and Legal transactions, and reads the cards for Prison. 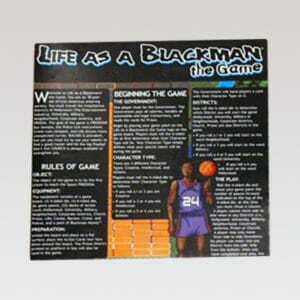 Players must first roll the 6-sided die to determine their character type, (Creative, Intellectual, or Athletic). Next, the player rolls the 6-sided die to determine which District they will begin the game, (Hollywood, The University, Military, or The Neighborhood). 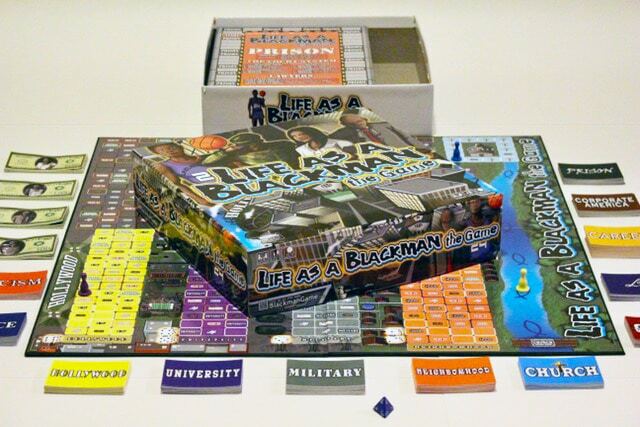 There are spaces on the game board that have the words Hollywood, University, Military, Hood, Corporate America, Church, Prison, Life, Career, Racism, Crime, and Police. There are cards corresponding to these spaces on the board called Action Cards. The player must pull a card every time they land on a space with a word on it, except for Crime, which is optional, the player has the option to pull a Crime Card. 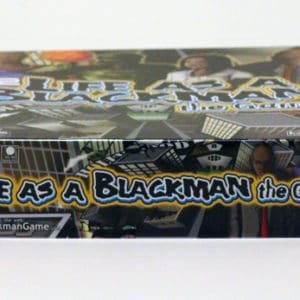 Each card has a specific detail on it relating to the space with an action that the player must carry out on the board. 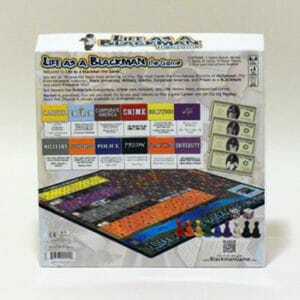 For example, a player may pull a Life card that reads, Your brother moves in with you, Pay $1,000. 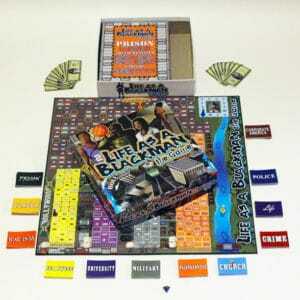 The player would then have to either pay the $1,000 or go into Debt, which may result in a trip to the Neighborhood. Corporate America, Church and Prison are other Districts in the game that offer other types of challenges that we face in everyday life. 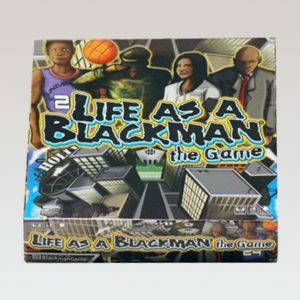 There are Paydays on the board, which allow the player to receive a salary, if they have a career, pay child expenses, or even rent. 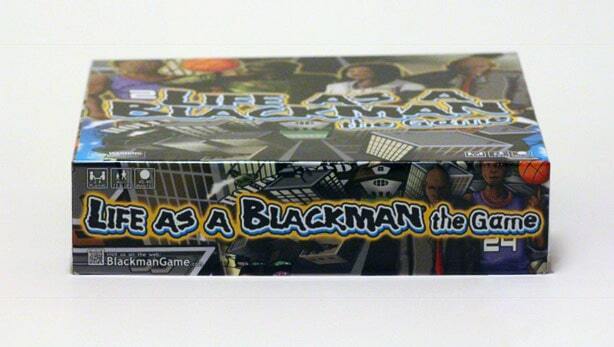 Players may purchase and sell cars for use Downtown, get married, have children, and even get divorced. 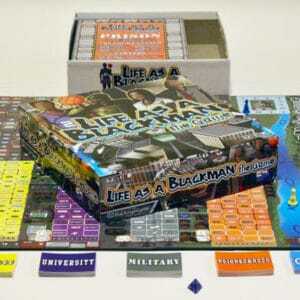 Every facet of everyday life is incorporated in this board game, including Lawyers, and Debt. The first player to reach the space FREEDOM wins the game. 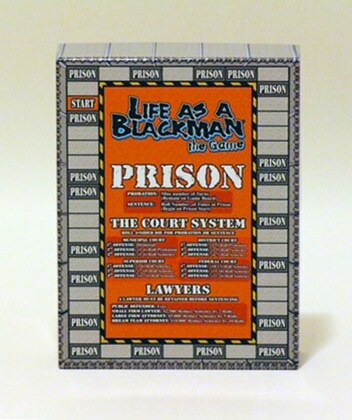 The game consists of one (1) 24″ x 24″ quad-fold game board, two (2) dice (6-sided die, 4-sided), Nine (9) game pawns, 360 Cards, BlackMan Money, and Prison platform.